A derailment at Heathfield, which occurred on the 19th April, at about 7.32 pm, on the London, Brighton, and South Coast Railway. In this case, the 6.45 p.m. down passenger train from Tunbridge Wells to Eastbourne, after having stopped at Heathfield, was proceeding from the down loop to the single line, when the engine and the two leading coaches were derailed, all wheels, at the facing pints of the over-run siding. Two passengers complained of shock. Both tongue rails of the points were damaged, and I number of fish bolt sad chairs broken. The train consisted of three bogie composite coaches with a six-wheeled brake at each end. It was drawn by Tank Engine No. 616, 0-4-2 type, total weight in working order 43 tons, 10 cwt. The engine and train were fitted with the Westinghouse brake, operating blocks on all wheels with the exception of the centre pairs on the six-wheeled vehicles. Heathfield is situated on the Company's single line branch about midway between Tunbridge Wells, at the northern end, and Eastbourne at the Southern end. The general direction of the station platforms is north and south, the down loop being to the cast of the up loop. From the southern end of the station the line towards Eastbourne is on a curve of about 1,500 feet radius to the west. The goods yard, situated to the east of the line, takes off the down loop by means of a trailing connection some 370 feet south of the platforms. The south signal box (containing 23 working levers) situated east of the down loop, controls the connections and the signals at this end of the station. An over-run siding, about 500 feet clear, is at this end of the station in extension of the down loop. It was at the over-run facing points (No. 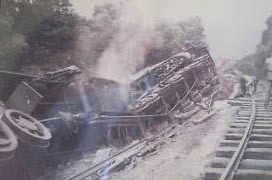 9) that the derailment occurred. The line through the station, up to about .these points, is on a falling grade towards Eastbourne of 1 in 304. From here southward the gradient creases to 1 in 50 round the curve. The whole of the over-run. siding except a short length at its southern end is on this grade. The points (No. 9) on which the derailment occurred are equipped, in accordance with the Company's standard practice, with the Saxby-Farmer locking bar connections and the Kirby detector situated between the tongue rails. The weight of rail is 96 lbs. per yard. The tongues are formed out of 30 feet rails and are connected together with 5 stretcher rods. In addition a sixth split-blade bar is provided for bolting and detecting the tongues. This is an exceptional case of the failure of approved detecting apparatus to indicate that points were not in a fit state for the passage of a train in the facing direction after they had been run through by a previous train in the trailing direction. This does not mean that the detection mechanism is open to criticism. It was in fact due to its strength that the apparatus permitted the starting signal to be lowered, and therefore failed to indicate to either the signalman or driver that anything was amiss. The train in question, having received the single line staff, had started from the don platform with starting and advanced starting signals cleared and had attained a speed, it was stated, of some 3 or 4 miles per hour, when, on reaching facing points No. 9 leading from the down loop to the over-run dead-end siding, the engine straddled the tongue rails and became derailed, causing also the two leading coaches to leave the road. The 5.55 p.m. down passenger train from Tunbridge Wells arrived on the down loop at Heathfield at 6.49 p.m. The engine was uncoupled and ran round the train. On receipt of a flag signal from Porter Signalman Leeves, who was on duty in the south box at the time, the train was then propelled over point’s No. 9, in their normal position, into the over-run siding, to wait there to make the 7.48 p.m. return train, to Tunbridge Wells. Leeves then had to deal with the 6.25 p.m. up passenger train which arrived on the up loop from Eastbourne at 7.9 p m. This train is booked to return to Eastbourne and had two horse boxes in rear for Heathfield. The engine was therefore detached and ran round to the rear of the train. The two horse boxes were shunted via No. 11 points into the loading dock at the back of the down platform, and the engine returned to the rear of the train. Leeves then set the road by pulling points 9 and the bar 10, which locks them, for the shunt movement,, for which he cleared disc signal 23,- for the train to proceed from the up loop to the dam loop and on to the main line via the facing crossover No, 9. The train was 'then propelled into the goods yard to await its return journey to Eastbourne. This movement was completed about 7.23 p.m. In the meantime Leeves had accepted, at 7.13 p.m., the 6.45 p.m. train from Tunbridge Wells-that concerned in the accident--and it had already left Mayfield, the next station, when, in order to comply with regulations, he proceeded at about 7.23 p.m. when the last movement was completed, to clear the over-run siding before allowing the 6.45 p.m. train to approach the station. He accordingly pulled disc signal No. 4 and gave Wheatley, the driver of the train standing in this siding (the 5.55 p.m.) a hand signal to leave the siding 1 for the up loop. Wheatley, running then' tender fist, brought the train out, traversing i points No. 9 in the trailing direction and the cross-over 12 in the facing direction and ran I to the water column on the up line. Leeves then put back disc No. 4, replaced cross-over No. 12 to normal, and cleared the signals for the 6.45 p.m. train, which arrived about 7.30 p.m. and left at 7.32 p.m. Driver Gutsell of this train stated that he was not held up at the home signals, and that he found the starting signal clear when he arrived at the platform. Leeves stated that it was not till he came on duty next day that he "began to realise that this train was derailed through No. 9 points having been 'run through trailing by a previous movement." On examination after the accident it was found that the only damage affecting the points, from which conclusions can be drawn as to the cause of the derailment, occurred to the tongue rails. The outside tongue, viz., the one lying against the stock rail as the 5.55 p.m. train drew out of the over-run siding, was broken away at the head to a depth of some 1: inches for a length of about 12 inches near the tip. The tip itself for a distance of 2 inches was not damaged. This tongue rail was bent about 14 inches towards the centre of the track at the point of damage, but .the tip remained in its proper position against the stock rail, and the detector rod was not bent or displaced. The other tongue was broken away at the top at a distance of 1 foot 5 inches from the tip for a length of 5 inches and to a depth of about 24 inches. This tongue was bent to the same extent outwards, from the centre of the track at the point of damage, and its detector rod was also undamaged. The points were locked (lever No. 10) at the time the movement from the over-run siding was made. Driver Wheatley stated in his evidence that, owing to the heavy rising gradient of 1 in 50, he could not have passed over the points at more than 3 miles per hour. He was running tender first and with the engine working hard, he neither heard nor felt anything unusual. It is obvious, I think that the engine gently pushed its way through the points, the thin portions of which, at the tips, broke away as described. These points are of particularly rigid construction and the blow at this low speed was not sufficient to cause the detector rodding or stretchers to buckle, nor to damage in any way the casting of the Kirby detector through which the rods pass. It was due to this, that the detector slide mechanism did not obstruct the movement of the starting signal wire, and that, therefore, immediately after the movement, Leeves was able to pull off this signal. The tips of the tongues were properly set but the flange of the near-side leading wheel of the engine must have encountered the false nose due to the inward bend of the tongue on that side. The flange was assisted in crossing the tongue rail at this point by the gap (14 inches in depth), in the head which had been broken away. The engine took the general direction of the over-run siding, the inner rail of which acted as a guide. From the foregoing it will be seen that, from 6.49 p.m., the time the first train arrived, till 7.30 p.m. there was considerable, though not unusual movement, in this single line station. I am satisfied that Signalman Leeves had no knowledge at the time that the points in question were not fit for traffic. Inadvertently he must have made the initial mistake of failing to set these points in the proper position for the engine and coaches of the 5.55 p.m. train to leave the over-run siding. It appears that when he came to lower the signals for the 6.45 p.m. train he was not reminded by the reverse position of the levers 9 and 10 of this initial mistake or, therefore, of the possibility of the points having thereby been damaged. The fact that he was able to lower his starting signal proves that he was not warned by the detection apparatus that anything was wrong with the points. His evidence was given in a straight-forward manner, and though responsible for the damage done to the points, I consider that, in the special circumstances of the failure of the detecting apparatus to give him notice of this damage, he is absolved from further blame. He has 20 years service with the Company and has been at Heathfield for 8 years. Neither of the engine-drivers can be held responsible-Wheatley for the damage to the points, or Gutsell for the subsequent derailment. The accident would probably not have happened had the movement from the overrun siding been controlled by a trap and a disc signal (led by either of the existing discs Nos. 4 or A depending on the setting of the road), instead of by hand signal from the cabin. On this turns the question of the use to which the over-run siding is being put. Traffic at this station is heavy and the siding has to be used for marshalling the goods yard daily. Leeves stated that he kept the siding as clear as possible, but he was at times obliged to continue shunting thereon and accept a down train at the same time. He occasionally had to stand stock with an engine at the far end on this siding, but it is not customary to use the siding for stabling stock. I recommend that this siding be recognised in future as a shunting neck for the goods yard, and that it be equipped with trap points and a disc as described above. This will reduce the present clear over-run length, 1,085 feet from the starting signal to, say, 585 feet. In view of the fact that all trains stop here, and that there has been no trouble in the past, I consider that, having regard to economy, this reduced length will be sufficient for safety. I understand from the Company's representatives, with whom I discussed various alternatives, that they propose to carry out this work, which will involve extra levers in the cabin.